In the summer months we choose to keep all of our dogs coats shorter. We live in the country and our Silkies are very adverturous. 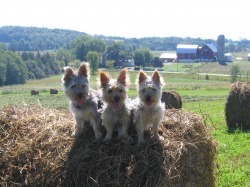 They love to explore the farmer's fields surrounding our country home. The shorter coat is more practical when it comes to clean up after an awesome adventure. Jake is the man of the house. He is also featured at the top of this web site sporting his shorter coat. Jake likes running through the fields in pursuit of that pesky bunny that lives nearby, and his short summer coat is easier to keep the burrs out of. I honestly think he believes he is the king of all. My eldest daughter takes great pride in Jake. She has purchased him a better wardrobe than I have. She was especially proud of his Spiderman costume that he wore trick-or-treating last Halloween. Jake has one weakness though; he would sell his soul for a back scratch! He will often come up and sit on my lap because I give the best back scratches. He really is the king of the castle! Zoey is an absolute treat to be around. When everyone is out gathering eggs and playing on the lawn, Zoey is right in the middle of it. Zoey does not like the squirrels visiting our bird feeder. She will whine and whimper at the window to tell on our little visitor. If Zoey wants to play or go outside or if she thinks it's dinner time, she will come over to my wife and tap her on the legs with her paws. My wife will go through the list, asking Zoey which it is that she wants. "Outside? Supper?" Zoey will patiently wait until she hears the right phrase, before giving a little bark of confirmation to signal that we've figured out what she wants. She is one smart dog! out the door when it opens and proudly prances to the van. She is such a cutie! Ruby and Zoey are sisters and best friends. 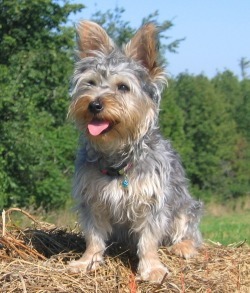 Silky Terriers have an excellent temperment. 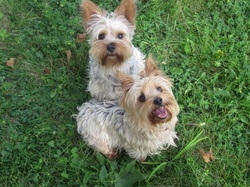 They are lively little terriers that are full of personality. They are both playful and loving. 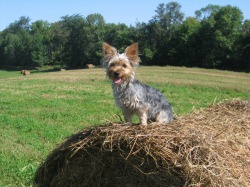 Silky Terriers are small enough to travel well with you where ever you might want to take them, yet sturdy enough they can be rough and tumble with my ten year old. Our Silkies are excellent with kids and other animals. All three of our little ones love to have a great game of fetch or tug of war with their toys, yet are just as happy to sit and cuddle when we are watching television. 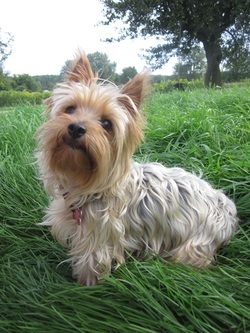 The beautiful thing is that Silky Terriers do not shed their hair all over you or your furniture, nor have that familiar doggy odour that most other breeds possess. It doesn't get any better than this!